Professor Michael Durst in the Middlebury College Physics Department proposed this project during the summer of 2017. The idea was to begin creating a series of videos that show the professor outlining a lab for students before they are asked to conduct the lab themselves. This project was challenging because it involved: sound recording, photographing, and video recording. All of the footage was obtained from scratch during filming/photographing sessions. The software used for sound editing was Audacity. For photographing and video recording we used Canon SLR cameras provided by Middlebury College’s Davis Family Library. The bulk of the project was edited in Adobe Premiere Pro, a versatile video editing suite. All of the photos had to be retouched and cropped using Adobe Photoshop. Aside from creating the video itself, one of the main goals of this project was to create a template for future videos to be created for more labs in the department. An official shot list, software list, and editing template needed to be created so that the next videographer and photographer could maintain consistency as new videos are created. 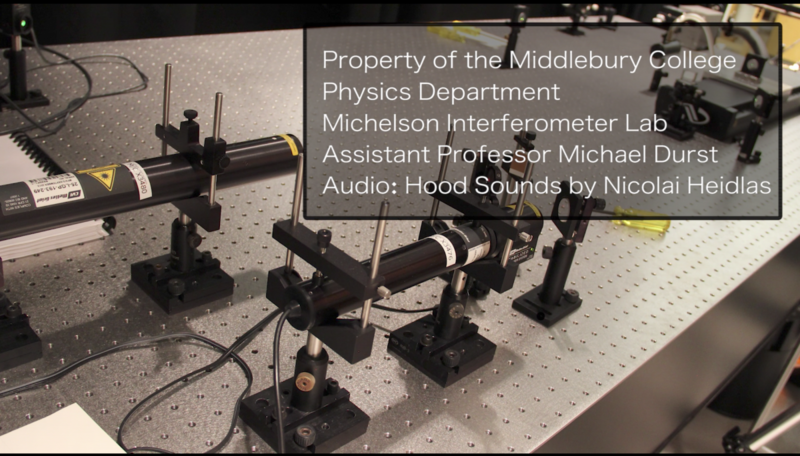 Overall, this project was engaging because it was created entirely from scratch which required me to become familiar with the equipment at Middlebury for filming and photography. The project familiarized me with creative commons background music, how to properly credit sources on public media projects, and most importantly keep long lectures and labs concise in a 5 minute video. I love film-making and editing so this project was really fun to take part in! My first project as a Digital Media Tutor was assigned over summer in June of 2017. This WordPress website was created for Professor Tom Beyer’s first year seminar. The seminar is based on Dan’s Brown novel Origin and serves as a place where Beyer’s first year students provide a chapter by chapter analysis of the book throughout the duration of the course. 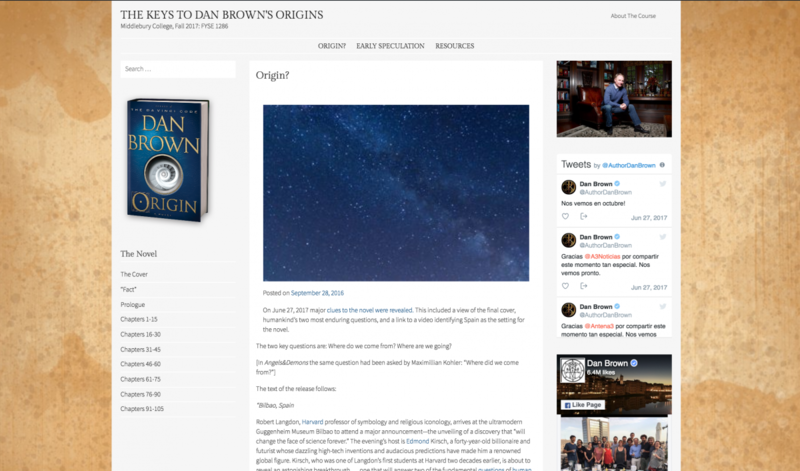 The website features Dan Brown’s social media accounts such as Facebook and Twitter down the sidebar so site visitors can get real time updates from the author about the novel’s release on October 3, 2017. This was done using Plug-ins provided by WordPress. Professor Beyer publishes the website’s main content himself. Through the use of WordPress widgets I was able to isolate Beyer’s work from his students’ posts. When creating this website, we kept in mind that students would be uploading/writing posts weekly and adding them to the chapter pages. To make this process as simple as possible, a separate page was created for each chapter of the novel so rather than creating new posts and categorizing them, students can click on the chapter and edit the page to add information. This was my the first official website I created as a digital media tutor and it took approximately 3 weeks to complete. I liked that this was a complex website with many layers of functionality. This project really helped me develop expertise in using WordPress for website development. In the fall of 2017 this article was written about a culminating experience with the current cohort of FYSE students.